Blast it or place it? Wait for the keeper to move? Or pick a spot and stick to it? There are many thoughts going through a penalty taker's mind as soon as the referee points to the spot. Nobody's expecting the keeper to save it. But he'll be a hero if he does, casting the kicker as the villain. So where should you strike the perfect penalty? Research carried out by Liverpool John Moores University came up with at least one definitive solution, as Professor Tom Riley revealed. 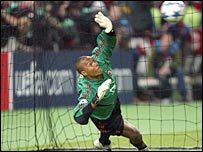 "A well-placed ball, high to the corner, will not be stopped by the goalkeeper even if he anticipates it. "There is not enough time to react, so a kick placed in this area would have a 100% strike rate. "Some players blast the ball straight down the middle, assuming that the goalkeeper will move, but it's not always successful." Though the top corners may have a 100% strike rate, the shot is very tricky to pull off and therefore a bigger gamble. But it's an interesting alternative to the conventional theory that you will often hear from professionals, managers and commentators. Hitting the inside of the side netting, low down just inside either post is often the target for a penalty taker. 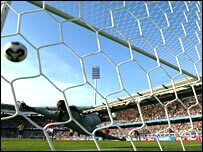 According to Professor Riley's theory, it has a greater chance of being saved - as unless the ball is well struck, the keeper can still reach it - but it is easier to pull off. Is there more thought involved in scoring a penalty than just running up and blasting the ball? Psychologist Peter Naish thinks so. "Penalty takers mention not thinking too deeply, yet trying to fool the goalkeeper," he said. "We do many things on two levels, such as thinking where to put the ball (or where to fake it), but not thinking about what the feet, legs and body will do to achieve it. "The more we practise, the more our actions become automatic skills - unconscious memories of how to react. "These memories take over when thinking fails, such as in front of 80,000 fans."